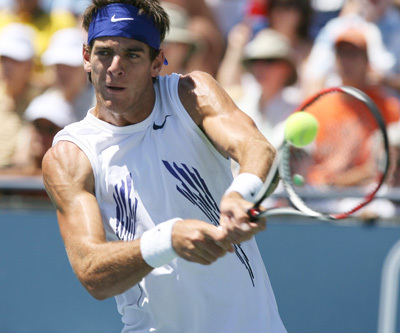 Teenager Juan Martin del Potro of Argentina continued his winning streak by outplaying veteran Andy Roddick. His powerful groundstrokes and consistency gave del Potro his first ATP hard court victory. Last month he won two clay court titles in Stuttgart and Kitzbuhel. del Potro now holds a 14-match winning streak, which is second-longest of this season behind only Rafael Nadal (32 consecutive wins). 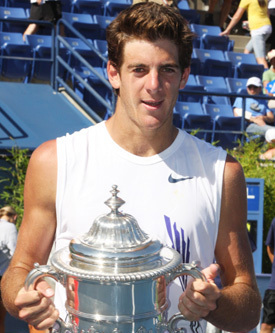 del Potro is the first teenager to win the Los Angeles title since Pete Sampras in 1991. This win moves del Potro into a tie for 6th place with Nicolas Kiefer in the US Open Series. You couldn’t have asked for two more dominating semifinal performances Saturday at the 82nd annual Countrywide Classic as top-seeded Andy Roddick moved into his first Los Angeles final and will face perhaps the hottest player on tour in 19-year-old Argentine Juan Martin del Potro in today’s 1 p.m. final at UCLA. Roddick, trying to win his third ATP title of the season, dropped just four games for the third consecutive night, needed just 62 minutes to beat unseeded German Denis Gremelmayr, 6-2, 6-2. Showing he’s more than worthy of a world top 20 ranking, Del Potro dismissed American Mardy Fish, 6-2, 6-1, in just 81 minutes for his 13th consecutive ATP match victory. Bothered by nagging neck and shoulder injuries coming into the tournament, Roddick hasn’t unleashed his fastest serve here, but it’s been solid and consistent enough during the week. He has yet to lose a service game holding his serve all 24 times. Fans at UCLA aren’t the only ones looking forward to today’s final. Fish said he wouldn’t mind sticking around and watching. “It’s certainly going to be a good match to watch,” he said. The former world No. 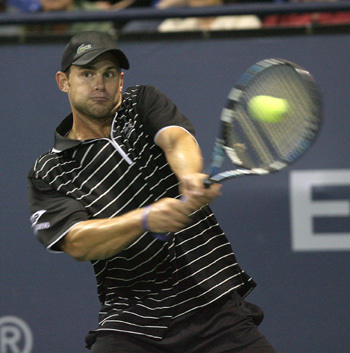 1 Roddick will be playing in his 39th career final today. He has a 25-13 record in final-day matches. Del Potro, currently ranked No. 23 in the world, holds a 7-4 record over Americans. In the doubles final, India’s Rohan Bopanna and American Eric Butorac will face Travis Parrott of the U.S. and Dusan Vemic of Serbia. Bopanna and Butorac defeated Del Potro and Fabio Fognini 7-6 (4), 4-6, 10-5 in one semifinal while Parrott and Vemic downed Russians Igor Kunitsyn and Marat Safin 7-5, 6-4. Bopanna has lost all four ATP doubles finals he’s played in while Butorac will also be playing in his fifth ATP final (3-1) with all three wins coming last year with partner Jamie Murray. It will be a return trip to the final in Los Angeles for Butorac who lost to the Bryan twins here two years ago. World No. 3 Novak Djokovic interrupted the Cinderella story that was unseeded Mardy Fish, outlasting the American in three sets 6-2, 5-7, 6-3. Djokovic looked as if he would claim an easy victory after winning the first set, followed by getting the first break at 4-2 in the second. However, Fish rallied to claim five of the next six games, forcing a decisive third set. Djokovic uncharacteristically showed his frustration during Fish's comeback, slamming his racket to the court on multiple occasions. The difference in the match came in the third set with Fish clutching a triple break point, however, Djokovic crushed three straight aces, which led to him holding serve. In the next game, Djokovic took the lead for good, scorching a backhand winner on a double break point. "That was a crucial moment and it was the turning point in the whole match," Djokovic said. "If I didn't come up with the three aces, it could go either way." The win even exceeded Djokovic's 2008 expectations for himself, only three months in. "It's been a dream start, of course," Djokovic said. "Before I started playing this season, I said that my two goals is to be consistent with the results, I reach the Masters and hopefully win one Grand Slam. I did all that in very, very small amount of time. But again, I don't want to stop here, even though I've been playing fantastic...I'll try to keep going in Miami, and I'm the defending champion there. But coming up from Indian Wells as tournament winner, it's much easier to play." For Fish, although the dream tournament came to a halt a few games shy of his first Master's title, the 26-year-old, who climbed better than 40 spots in the rankings, will take a ton of confidence in his desert performance. "It would be really nice to take this momentum and take this confidence into next week, because next week is just as big of a week for me," Fish said. "I didn't play last year. I think I put myself in a nice position now around 40 in the world with not a match to defend until August 19th, which I checked." Fish was hoping to become the first American to win at Indian Wells since Andre Agassi defeated Pete Sampras in the 2001 final. No. 1 seed Ana Ivanovic grabbed her first WTA title of the 2008 season, beating Russian No. 2 Svetlana Kuznetsova in straight sets 6-4, 6-3 Sunday at the Pacific Life Open. After needing just one break to claim the first set, Ivanovic rallied to win the last four games of the second set en route to her sixth career title. "It's a great victory for me," Ivanovic said. "When I managed to break her on 4-all it gave me confidence, and went strong from that point on. That game I stepped up a little bit more, and I realized that's what I got to do." Kuznetsova admittedly was not all smiles about her finals performance, though she credited Ivanovic for her solid play. "She played incredibly well in the first set and on," Kuznetsova said. "Every important point her winners were on the line, but I could have played better." Ivanovic hit an impressive 30 winners, compared to just 19 errors. "I was a little bit nervous coming into this tournament," Ivanovic said. "It's such a strong field and still I'm the No. 1 seed. Obviously more pressure comes into the play. The first few matches I was more nervous, but then I just started to focus on each match and not even think about whom I play, just to do what I have been doing in practice.